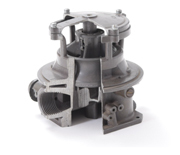 Problem – Substantially reduce machining costs for a carburetor body. Solution – The original sand casting for the carburetor body required extensive machining to create 33 assembly holes. Die cast tooling was designed with five slides so that all the assembly holes could be cast to size for self-tapping screws. The 2.2 pound, 5 x 6 inch carburetor was precision cast in Al 384 in our 400-ton machine. Benefits – The cost savings achieved by eliminating the machining paid for the die cast tool at a production level of less than 5,000 aluminum die castings. Problem – Simplify assembly and reduce number of component parts. Solution – We have reduced assembly time for a wide variety of products by developing cast-in-inserts. Our multiple aluminum casting cells and the ability to cast parts from five grams to five pounds enables us to use this process in products ranging from small engines to golf putter heads. A small engine flywheel with a cast in magnet assembly and counter weight. A small engine cylinder with a cast in steel cylinder sleeve. A carburetor assembly with a cast in steel jet. Pipe line tools with cast in magnet assemblies to eliminate straps. 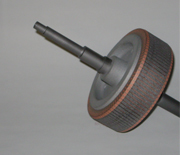 A small motor rotor assembly with a cast in steel shaft and brass commutator assembly. Golf putter heads with cast in brass counterweights. Motor housings with cast in bronze bearing bushings. Benefits – The cast-in-inserts have eliminated assembly steps and reduced production time anywhere from 50% to 75% depending on the component.